So I decided to teach Bobby* (not his real name) some tips and tricks I picked up over my years in this game. Just like I figured… he retained information and asked good questions. Bobby got his first paycheck and committed the ultimate sin. He bought probably the worst welding machine ever made. Yup. He spent his hard earned cash on a box of bolts. I know what your thinking ” It can’t be that bad!” Well, to be honest, there are there are a few upsides. So I wanted to do a full review of the Goplus MIG 130. Ok -I hear you – let me explain. This thing is cheap! While writing this review I found a link and it was under $100. Yes – a sub $100 welder!. So for someone just starting out, like Bobby, it seems like it would be a good deal. But after looking at the specs and doing some research you’ll see why purchasing this machine is like taking a crisp Benjamin and lighting it on fire. So, let’s get down to business on this Mig 130. I could tell you to go ahead and research the company to see if it’s a good company…etc etc. But just looking at the price point you know the score – so let’s get at it. No gas ports – Flux core welding only. So when you order this welder you get an “everything” you need to weld right out of the box. And there are several machines available like that. Here’s the deal: The mask you get is probably better for a Halloween costume. The wire included is terrible quality and the “brush”… well just go ahead and toss it. So I actually used this machine. I had Bobby bring this yellow box into my shop because I wanted to see for myself if all the information I found on the internet is true. And everything you might have heard about this machine is true. Get this: it does weld. You can actually build something with this machine. That’s the positive this machine has going for it. However, you’re going to be extremely limited. Since this is 110v you’re not going to generate high enough amps to weld much more than ⅛ thick material. But wait, there’s more. Since this is a flux core machine and you’re running low volts and amps your limited to thin gauge material. I know I just said that before… however, think about that….flux core and thin material. Let’s say you’re trying to weld 1/16 – the spatter is going to melt right through your material. Welcome to the frustration city, population: you. And if it doesn’t melt through your going to have to clean that stuff up – so you run an issue of damaging your work with the grinder as well. I think this is a great machine for the price. For the occasional welder or the home user it’s perfect- if you wanted to do production work you would definitely need to upgrade. I was surprised at the quality of the beads it laid down. Click here to read the original testimonial from Samuel F.
The goplus has way more cons than pros, so let’s cover the pros first. It’s dirt cheap. I could see how someone on a very restricted budget would buy this. Heck, I could even see why someone who welds every few months might want this machine. But, there are better options available. And I think it’s better to invest your money in a better machine, regardless of how often you use it – so I’ll have some recommendations for you. But first, let’s cover the cons. This machine is so restrictive in what it can do that it’s just not worth the cash. It’s too lightweight to do anything above ⅛ and the @ 1/16 you run a burn-through risk. You’ll also have to shell out more money for better wire and a good hood. And to upgrade this welder you have to throw it in a river. Now, if you really want a flux core welder I wrote a review of a Forney here. Yes, it’s more money but it’s built so much better. And you get technical support – which is way more than I can say for the goplus. But instead of a flux core welder, let’s get a little crazy. Really. Why not go with a “value” brand stick welder? You will be able to do so much more. RIght out of the box this stick welder can easily do ⅜ thick material. In addition to that, you can turn down your amps and carefully do ⅛. Just make sure you get some good rods. Oh, and here is a good shop apron I just started using. Now, if you wanted a good true MIG alternative I would go with the Hobart handler 140. It’s a great all-around machine that really has low splatter and will get you comfortable welding. Yes, it costs about 4x the Goplus – however, this is a machine that comes with world-class support, a great warranty and will handle a variety of jobs. In short, the Hobart or the stick welder will grow with you more than the goplus ever could. So, what’s the bottom line on the Goplus? 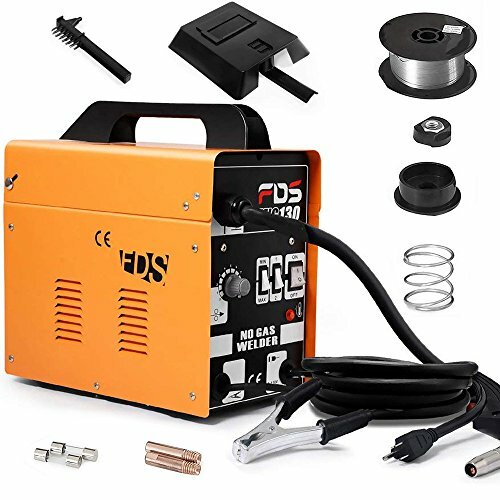 You may think you’re getting a great deal on a cheap machine- heck there are even a ton of great Amazon reviews on this thing – but as your friendly neighborhood welder I’ll tell you the truth. It’s a waste of cash. I’d rather you spend a bit more on a stick welder and have the chance to learn that skill set AND we able to handle heavier gauge metals. You may also be wondering about Bobby. Well, he returns that box of bolts know as the goplus and went with the stick welder. I knew he was a good kid.